Factory assembled and ready to use. Able to ship by UPS. 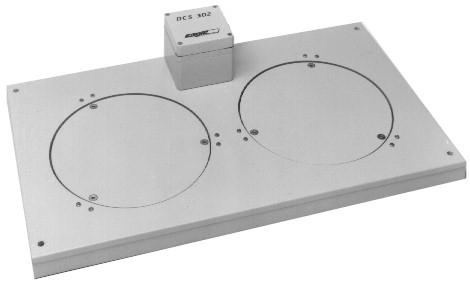 Load-cell electronics are enclosed in a NEMA 4X enclosure. Designed to survive hostile environments that would destroy other scales. Load-cells are located off the floor for easy access. The Model DCS302 is a compressed gas dual cylinder electronic scale. The scale base and electronics enclosure is manufactured using a non-corroding impact resistant plastic. The scale shall be an Eagle Microsystems Model DCS3O2 Dual Cylinder Electronic Scale suitable for weighing two (2) compressed gas cylinders having a maximum diameter of 12 inches I 30 cm. The scale base shall be anchored to the floor by the contractor with 3/8" dia. mounting hardware. Installation shall be accomplished without the need for special tools or liffing devices. Start up, calibration and operation of the scale shall not require the services of the manufacturer, however, assistance shall be available from a factory trained, local representative if required. The scale shall be comprised of a floor mount dual cylinder weighing base and a remote mount dual channel electronic indicator furnished complete with 15 ft./ 3 m. interconnection cable. The entire weighing system shall weigh less than 35 lbs. /16 kg for ease of installation. The weighing platform shall be a non-corrosive, high impact base, protected by 5 year warranty, suitable for weighing two (2) compressed gas cylinders having a maximum diameter of 12 inches/ 30 cm.. Scale base shall incorporate two independent reliable lever Systems to transmit each cylinders quantified chemical weight to its dedicated environmentaly sealed load cell. Load cells shall be temperature compensated 0 to 150.0 F I 0 to 65.0. Systems incorporating hydraulic load cells shall not be acceptable. All scale electronics, including the load cells, shall be enclosed in a NEMA 4X enclosure. Maximum height of scale base (excluding electronics enclosure) shall not exceed 1.6 in.i 4.1 cm. The electronic indicator shall be a two (2) channel device, with each channel providing an operating display of 0 to 150 lbs (or 0 to 68 kg. ), and individual electronic tare weight adjustments of 0 to 100 lbs (or 0 to 45 kg. ), rated for a total maximum capacity of 360 lbs /162 kg per channel. Display resolution shall be in 0.2, 0.5 or 1 lb. (0.1 or 0.5 kg.) increments providing an accuracy of 0.25 %of rated capacity. 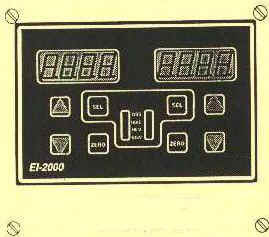 The electronic indicator shall provide a digital display of gross, tare, used remaining and total weights per channel. 15 ft. 5 m of interconnection cable shall be furnished as standard, however, the indicator shall be capable of remote mounting to a distance of 1000 ft. /300 m.
The entire scale shall be covered by the manufacturers Standard Warranty, which shall include the entire assembly for one (1) year from date of start up. The scale base shall be protected by an extended warranty for a minimum of five (5) years, which will provide warranty repair or replacement if the scale base is damaged through corrosive exposure. The scale shall operate from a 120 VAC, 60 hz (other) power supply. The electronic indicator shall provide a total of two (2) low weight alarm contacts. Each contact shall be rated at 1 amp @ 120 VAC and dedicated to the channel measured. The electronic indicator shall provide two (2) R8232 serial ouputs, each dedicated to the channel measured. A dual cylinder wall mount bracket shall be furnished, including safety chains and clips for securing two vertical compressed gas cylinders.